Every government program should be reviewed and evaluated from time to time to revalidate a central question: does the government need to be providing this particular service in this particular manner? Just because the government can provide a specific service, is it best placed to do so? Now might be an opportune time to examine whether the government should be managing the TSP, as running the TSP is getting more expensive each year – and with recent unforeseeable demographic changes and, separately, based on a reading of the 2013-2017 strategic plan, those costs will most likely continue to increase at a pace well above inflation for years to come. Hear me out before you dismiss the below proposals out of hand – the TSP was created in the 1980s, but there are a lot of cost-competitive and flexible options available now that weren’t available then. To keep up with the dramatic changes in the mutual fund industry, the TSP has had to increase its budgets by double-digits on average for a number of years now. This year’s requested budget was $201 million, which is an 18% increase over last year’s requested budget of $170 million. And last year’s budget was a 19% increase over the FY2012 budget. In all, TSP’s yearly budget has more than doubled since 2007’s $87.6 million requested budget, averaging out to more than 10% yearly growth rate. Budgets had actually contracted from 2003 to 2007 and probably contributed to lax security, among other things. Certainly, the increase in budgets is not without reason, given the range of issues TSP management has had to tackle and the new services introduced in the last couple of years, to include the Roth TSP option. 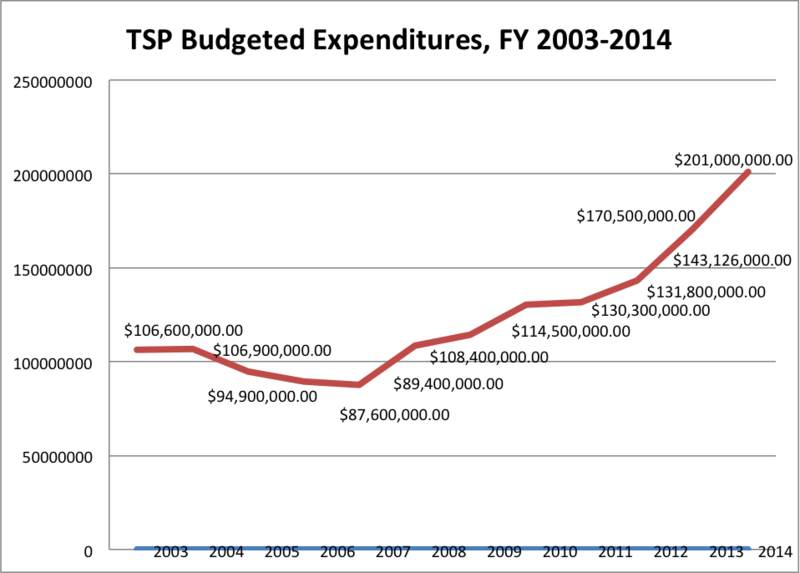 But the problem is that requested TSP budgets are growing much faster than anticipated even a few years ago. For example, a September 2011 budget estimate set the FY2013 budget at just under $148 million. The actual budget was about $170 million – a 15% increase over the estimate of just two years prior to the fiscal year. The actual $201 million budget approved for FY2014, by the way, exceeded the previous year’s $195 million estimate for this year (see this document, page 13), and the actual budget is closer to earlier estimates for FY2016’s budget of $205 million. It’s obvious FY16’s budget will be much greater than originally thought. All of this came after the 10-year budget estimates in September 2009 projected a total “increase…[of] $25 million over a ten-year period,” from a $114 million budget. This was obviously blown within just a couple of years. So budgets are increasing much faster than they have been projected to even a few years earlier. This trend does not bode well for future budgets. And given the sudden change in demographics – with new participants having to shoulder a much greater burden of retiring feds’ pensions than previous generations, among other issues – this will potentially put greater pressure on expense ratios we all pay out of our funds in coming years. To be sure, TSP administrators have done yeomen’s work in getting the TSP to where it is now. From where we were even ten years ago – limited open seasons, paper-based changes to contribution and investing styles, a limited web presence – to where we are now is astounding. There really was nothing like the TSP of its scope and scale when it was first conceived and established in the 1980s, and it is considered in many ways a model of what a basic defined-contribution plan should look like. That said, a lot has changed since the mid-1980s when the TSP was first conceived, and the basic structure of the TSP – investing in a limited number of index funds through a government office established to oversee such investments – is still based on the 1980s model. And this all would necessarily be quite expensive. Now, the question is, why should the federal government be doing all of this itself, when there are a variety of fund companies that can perform these services in a holistic fashion for TSP participants? Take just one example: the TSP’s mobile interface. I’ve been using banking and mutual fund company apps on my smart phone for several years now, but the TSP implemented a mobile solution (work-around?) just a few months ago. Moreover, I’ve been able to engage one-on-one with my mutual fund company now for years, and they have a variety of webinars and articles, etc. etc. already available on their website. Why should the TSP attempt to duplicate these types of services, when they are already offered by companies such as Vanguard, Fidelity, BlackRock, and on and on? More and more, when I compare my experience with my banks and outside fund companies, I wonder why there is a separate and growing government bureaucracy that handles almost all aspects related to the Thrift Savings Plan. The cost-competitive nature of outside index funds/ETFs is especially relevant when you take into account the additional services their fund companies provide, such as advisory and educational services, news feeds, and the rapid adoption of new technologies and security measures. In other words, the Thrift Savings Plan was unique in the 1980s and it therefore required government management when it was set up. But to my mind, this is no longer the case. The Proposal: Instead of offering a “mutual fund window” separately from the current TSP funds – a proposal that is just being reviewed now – why not offer the mutual fund window instead of the current funds? In other words, why not close down the TSP funds and offer a core set of ETFs that are exactly the same as the current TSP funds, and also feature a wider variety of index ETFs to take into account the minority of TSP participants who want a mix of different funds beyond the core offerings? Thus, someone like myself who wants to invest in a total international stock index fund – that features companies in Canada and South Korea and emerging markets – could do so. Those who wanted to invest in Real Estate Investment Trusts (REITs) could do so. Those who wanted to invest in precious metals, or index funds of “socially responsible” companies could do so. These latter funds might be slightly more expensive than straight-forward index funds, but some TSP participants want these options. And this would absolve TSP managers — and there will always be some govvies required to oversee the TSP – of having to create these specialty funds from scratch based on Congressional proposals. Yes, even the core ETFs are slightly more expensive than the TSP funds currently. But in return the fund companies that feature the ETFs would be able to provide the services that the TSP currently does not, along with developing new features, technologies, and personal engagement much quicker than TSP administrators could. Indeed, TSP participation in index ETFs could drive down the costs (expense ratios) of ETFs further, given the sheer amount of funds that would be transferred and only allowing ETFs under a certain expense ratio to be offered. Thus all “core” ETFs (those specifically matching the C, S, I, and F Funds) would have to have expense ratios of 0.05% or lower (which is the target set by the FRTIB, by the way). Specialty ETFs would have to feature expense ratios below, say, 0.2% to allow for their greater specialization. And the G Fund could conceivably be converted into a (closed) ETF – which, at the same time, would allow it to have the same rights as all other bond funds. That is to say, the Treasury would no longer be allowed to discontinue paying interest during debt ceiling impasses. This same security could be used as part of the myRA program, too. — No limits on trading of funds (with, perhaps, fees charged after a certain number of trades per month) — the small minority of investors who are active traders could do so to their hearts’ content with ETFs. — TSP recruiting and retention issues would be solved: fund companies could offer compensation and flexible benefits at market rates as they already do, as long as they maintained the ultra-low expense ratios on the ETFs featured in the new TSP. — Fund companies can offer a variety of innovative technologies to customers, including online tutorials, any of a variety of apps, market news, and yes, enhanced security, all unhindered by the government contracting process. This would also mean TSP management could operate with a much smaller workforce. — Fund companies could manage call centers and all aspects of engagement, for that matter. — Funds would be mixed in with a much larger investing population, so demographic concerns specific to aging/retiring/separating TSP participants would be much less of an issue. Also, participants could easily roll over their TSP funds to an IRA when they leave government or military service – important for younger military types who might leave after their required service is over. — Fund companies offering the ETFs would be extremely motivated to engage directly with members of the uniformed services (and civilians for that matter) to get greater participation in investing via a TSP investing window. So “America Saves” events would truly become venues for direct engagement with fund reps to improve saving and investing, for example. There are many advantages and possibilities with an ETF-based Thrift Savings Plan. The transition would be challenging, to be sure, but the benefits for TSP participants would be, I believe, significant.